Employers make lots of mistakes in the process of recruiting, interviewing and hiring new employees. I've seen some of the worst. I hope this article helps your company ratchet its own hiring practices up a notch or so. If you've got cautionary examples of such problematic practices, I invite you to submit them. I also urge you to share hiring practices that reveal your company to be a cut above the rest. I'd like nothing more than to publish a column of the ten smartest hiring practices. So without further ado, here are ten culprits that make hiring a problematic experience for lots of companies. Every manager is in a rush because his project is behind schedule and unanticipated problems have cropped up. When a manager needs to add staff, it's usually because he needs the right help and he doesn't have time to baby-sit whoever he hires. The manager needs specific skills now. This attitude is at the root of overly-narrow job specifications, and it can spell doom for the manager, for the new hire, and for the work. People are thinking and problem-solving machines. They see, they analyze, they learn and they marshal their skills, abilities and knowledge to tackle and do a job. This is what you're paying for when you hire a good worker: his abilities, not his specific knowledge of a technique or a tool. Almost by definition, a good worker can learn to use any tool you hand him, and he might even introduce a few tools you were unaware existed. When a person lacks some specific skills, a little guidance and a stack of manuals go a long way. You need specific expertise now? The odds that you'll find it are small, especially in a tight market. The cost of leaving the work undone until you find exactly what you want grows by the minute. The value of hiring a talented worker and giving him the space to learn while he works increases with time, from the first minute he is on your staff. There's nothing wrong with clearly defining the work you need to have done. Just don't make the mistake of overly-narrowing your definition of who can do it, and don't make the mistake of turning a project management problem into a hiring blunder. A manager who hires narrowly may be viewed as one who doesn't understand the broader requirements of the technology and products he's working with -- and enough hiring blunders can cost him his own job. Consider that the person who first talks to a prospective hire is your company's front line of communication with your professional community. What does an HR representative -- even the best one in your company -- really know about the work your department does? As an example, if your company is in the electronics industry, an engineer needs to see your company's technical and management credibility immediately. The closer to the recruiting process the engineering manager is, the more powerful is the attraction for the engineer. Don't make the prospective technical candidate step through bureaucracy before you have a chance to make your pitch. In today's market, you could lose him to an employer who makes a full-court press from the onset of the recruiting effort. What does this mean to your recruiting process? Turn your managers and team members into recruiters. Let them be the people who make the first contact with the candidate. Let your team create the candidate's first impression of your company. Show the candidate that hiring the best people is as important a function to your team as designing the best products (or having the highest sales, or applying the smartest budget management practices). Does HR go too far when screening? Where's the behavior in behavioral interview? Should I accept HR's rejection letter? Should I jump through hoops? PLUS: 5 sidebars packed with advice to give you the insider's edge! 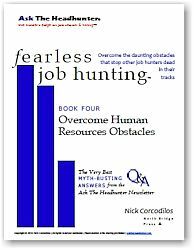 Learn more about Fearless Job Hunting! 3. 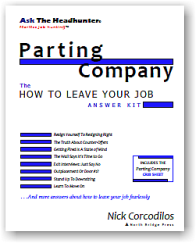 Hiring "what comes along"
Since when is your company's motto, Hire What Comes Along? When you retain a headhunter, you change the nature of your hiring strategy. You pursue the best workers who are most suited to your needs; you're not restricted to "what comes along". Of course, regular readers of this column know that there's no mystery to "being your own headhunter" -- so this is not an advertisement for headhunting services. The message here is that you should be keenly aware of the consequences of the process you use to recruit and hire. You're probably limiting yourself more severely than you suspect. A special caution: today we're told the best job candidates are part of a "hidden candidate pool". That is, they're not looking, but they're available. (It kind of sounds like the flipside of that other employment industry phantom, the "hidden job market," doesn't it?) The popular oxymoron applied to these rare folks is "passive job hunter". In trying to describe that group of talented workers who are not actively looking for new jobs, the media (and their associated recruitment advertising services) imply that these people really are available through conventional means, and that they're the right people for you. All you need is access to their vitals, which just happen to be in a data base which you can use for a fee. The problem is, these data bases -- no matter how specialized -- introduce the same selection bias into your hiring efforts. Bottom line: either you are identifying and pursuing those individuals you would like to hire, or you're shooting at the fish that are conveniently -- and rather naively -- swimming in a little barrel. So, run ads if you will. But, be aware that employers who identify, hunt down and entice the workers they really want have a jump on you. The typical job candidate arrives at the job interview knowing only what's printed in the want ad, and what your HR representative told her. What a great way to evaluate a prospective employee -- make it as much a "blind date" as possible! If she asks to speak with the hiring manager in advance of the interview, tell her "that's not done" and that "the manager is very busy -- you'll learn all you need in the interview". In fact, when she asks the name of the manager she'll be meeting next week, you might as well do what a lot of companies do: decline to give it to her. What nonsense. It's in a hiring manager's best interest to help the candidate prepare for the interview -- at least to the extent the candidate is interested in doing so. In fact, a candidate's lack of interest in the prep material or information you offer should signal that this is probably the wrong candidate to devote interview time to. What kind of preparation should you offer and encourage? That's up to you. But consider this: a candidate who makes good use of whatever resources you bestow prior to the interview will likely make as good use of the tools your department provides once she's on the job. It's a very telling test. Treat the job interview as an open-book test, and give the candidate the book before the interview. Let her talk with you on the phone; let her talk to some of your team members; let her ask questions in advance. If you offer and she doesn't bother, you've learned something important. If she takes advantage of the information, imagine how fruitful the interview could be. You could talk about things that really matter -- like how the candidate can use what she has learned to make your business more profitable. that you're the candidate who stands out? Human resources reps sometimes ask job candidates to recommend or refer their professional associates for other possible jobs; but it's different coming from the hiring manager. Hiring managers should learn to do this all the time. Here you are, meeting with a member of your professional community "from out there" in the industry. This is a person who knows lots of other sales reps, programmers, technicians, accountants, engineers, productions workers -- lots of the kinds of people your company is seeking to hire. If you're not discreetly mining this information, you're wasting a valuable opportunity in the interview. Suggestion: don't just gather these names. Invite the candidate and his buddies to your next company event. Don't have an event coming up? Start having them. Lots of them. Whether it's a barbecue, a picnic, a bag lunch featuring a presentation by a company expert, a hospitality suite at the next product fair, or beers at the local watering hole after work on Friday -- this is how you enlarge your circle of professional contacts. And it's how you identify more of the kinds of people you want to hire before you need to hire them.